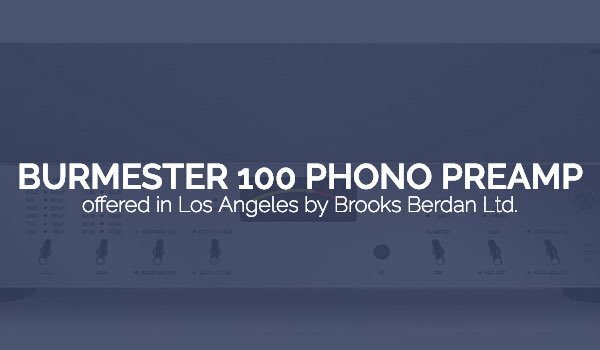 Burmester 100 Phono Preamp – Brooks Berdan Ltd. The 100 Phono Preamp is probably the world’s most comprehensive Phono Preamp available. A key feature never achieved before is the ability to professionally digitalize analogue records. 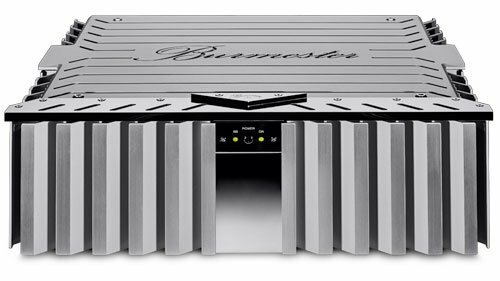 Burmester’s new 100 Phono Preamp is a highlight for all analogue-fans. 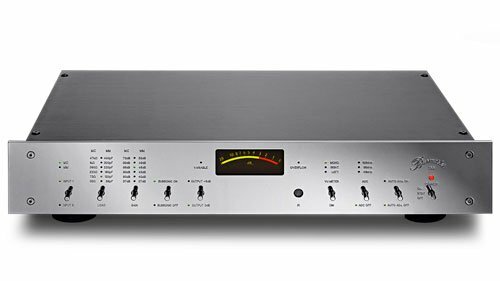 The 100 is a reference to the successful 838 Phono Preamp from the 80’s. The final result is a return to the roots of Burmester’s story of success, combined with state of the art technology from the 21st century. 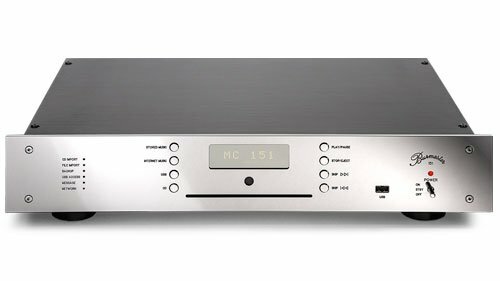 The 100 Phono Preamp was designed to provide record-fans with an ultimate sound quality and a digital preservation of their tonal treasures. The 100 Phono Preamp aligns carefully selected building parts, circuit technology and precise engineering with faultless analogue sound. It represents the perfect intersection between the processing of finest analogue signals and practice-oriented technology. With this device, it is possible to transmit your analogue record collection in the highest-possible resolution to a server, a hard drive or directly to a CD recorder. The Signal-To-Noise ratio, responsible for acoustic noise, humming, or distortion, is at the highest possible level. All measurements of the phono preamp attain the absolute minimum that can be realized in theory and practice. Thus, in all probability they represent the state of the art at present and in the long term. Inputs: Fully equipped, the 100 Phono Preamp offers two balanced phono inputs (XLR 3pol. female), which can be configured as MM or MC versions. Thus, it supports the connection of record players with two different cartridges or the connection of two record players, each having a different cartridge (MM/MC). The 100 Phono Preamp automatically recognizes the MM or MC module, and thus has a very simple operation. In addition to that, all settings (impedance, gain, subsonic, output 0 dB/+6 dB, Auto Adjust) are automatically stored and are available when changing inputs. XLR-Cinch-Adapters: Record players are ideal balanced sources. Therefore, in order to achieve the best sound quality, tone arm leads should always be used with XLR-plugs. The plugs can be ordered from Burmester. If your tone arm cable does not have XLR plugs, you may use the provided adapters. Input resistance/input capacitance: The input resistance of the MC version (33 , 75, 220 , 390 , 1 k, 47 k) can be adjusted. Thus, impedance can be adjusted to any cartridge. 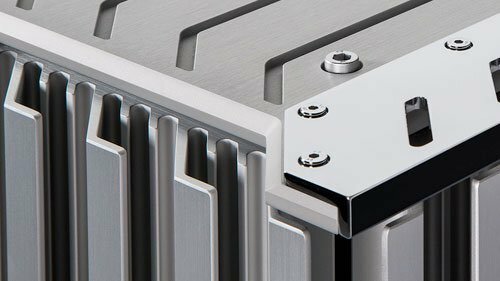 This certainly also applies to the adjustability of the input capacity in the MM version (68 pF, 120 pF, 180 pF, 220 pF, 300 pF, 400 pF – input resistance fixed at 47 k). The input impedances are changed via relay circuits. This results in a signal path which is as short as possible. Interfering signals can therefore be reduced to the absolute minimum. The input sensitivity can be selected in six steps for every module for an ideal level and volume adjustment. Subsonic filter: In order to achieve best sound results even for old or wavy records, a connectible subsonic filter prevents low-frequency deflections of the woofers. 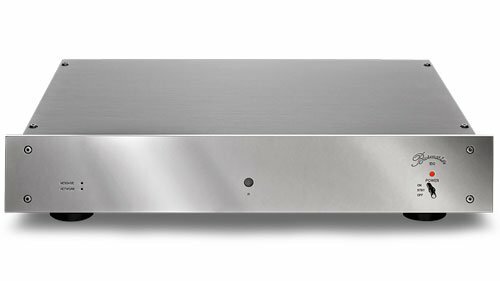 World innovation: AUTO ADJUST: An exceptional highlight of the new 100 Phono Preamp is its AUTO ADJUST function. With a simple touch of a button, you will receive an automatic adjustment of the cartridges’ left and right channel, up to a precision of 0,2 dB (2 %) and to a channel imbalance of 6 dB. Outputs: The output level can be set to fix or volume variable. In combination with an additionally adjustable output amplification of +6 dB, it is possible to connect the phono preamp directly to power amps or active loudspeakers without a separate preamplifier. In that case, the volume can only be controlled via remote control. Phase reversal: The balanced analogue output as well as the unbalanced analogue output are suited for phase reversal. Therefore, all different kinds of amplifiers can be connected. The analogue output stages are perfectly suitable for low-resistance inputs, due to the high driver capability of their X-Amp2 modules. DC-coupling: The DC-coupled signal path without distorting capacitors results in a very precise reproduction of the low frequencies, because there is no phase shift in the audible range. 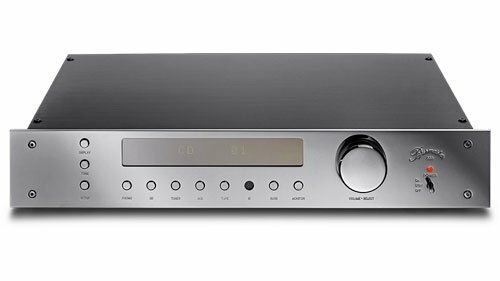 A/D converter: Due to the 100 Phono Preamp’s optional A/D conversion module (ADC) with USB and S/P-DIF outputs, the analogue signal from the record can be digitally recorded. This means, your record collection can be archived on CDs or your music server. 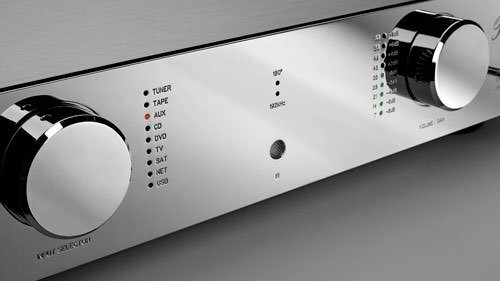 Before the signal passes the A/D converter, it passes the Burmester X-Amp2 stages. 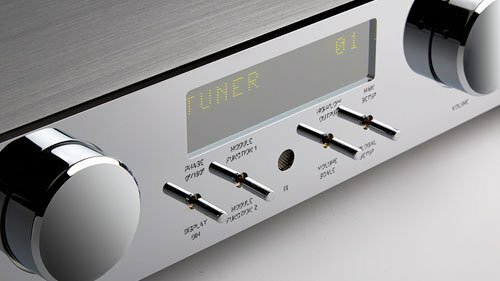 As a result, the signal receives the Burmester-typical sound characteristics even before conversion. The sampling rate for the A/D conversion can be selected between 48 kHz/24 bit, 96 kHz/24 bit, 192 kHz/24 bit for a sound adjustment according to personal preferences and for obtaining the highest possible sound quality. VU-Meter: The modulation for the right, the left or the mono-sum of both channels is indicated by the VU-meter. Therefore, with the according GAIN-setting, you can achieve the highest-possible resolution of the A/D converter. Furthermore, the level indicator shows imbalances between right and left channel instantly. At the same time, an inertia less LED (Overload) indicates over modulating of the A/D converter. The appearance can be configured individually or adjusted to other components with the illumination of the VU-meter and the dimmable LEDs. 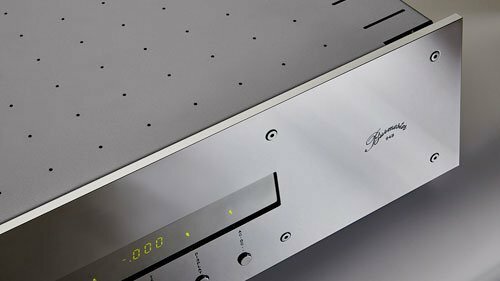 Burmester goes Green: The 100 Phono Preamp has an internal analogue power supply. Due to its very low power consumption in Standby mode (<1 W), it fulfils the highest environmental power requirements. DC IN/OUT: Other units can be switched on by remote control due to the Master/Slave function via DC IN/OUT. BurLink: The optional Burmester Link module allows the operation of control systems like AMXTM und CRESTRONTM via RS232 and USB. Carbon fibre feet: The 100 Phono Preamp is equipped with vibration-isolating feet with carbon fibre clips for an ideal resonance decoupling. Remote Control: The following functions can be controlled via remote: Input, Load, Gain, Subsonic, High/Low-Output, ADC, DIM, Volume, VU-Meter. Professional Use: With regard to measurements, the 100 Phono Preamp meets the highest possible standards. Thus, it is even suited for professional use. Whether you would like to use it for broadcasting studios, recording studios or as a tool for archiving record collections, the 100 Phono Preamp meets highest demands.